MAGIC (Y0 Sul) is the directorial debut of actress/singer/artist Ku Hye Sun. It was first released at Jeonju International Film Festival on the 1st of May this year. Then had its VIP premiere last 16th of June that was attended by Director Ku’s family and friends. When the movie was shown for the public on June 24th, it did not hit box office mark but it gained mixed reviews from critics and movie goers alike. Those who got the chance to watch it in a movie house must have had a better experience since the music is its main core. I personally find this movie a bit hard to understand at first. It takes time for one to process this and it will help a lot to read reviews and also most of Ku Hye Sun’s interview to grasp the story. She usually explains her visions well enough. I think Ku Hye Sun gave focus on the music and the visual rather than the overall story. She tried to convey her thoughts through this and put less dialogue. Moreover, she had an open-ended finale making the viewers think and ask questions. Both an advantage and a disadvantage, IMO. To start of this review, I would like to share Ku Hye Sun’s introduction to this movie. 사랑의 방식이 다른 청춘의 세 남녀가 있다. 이 청춘 남녀의 열정은 열등감을 동반한다. There are these two young men and a young woman whose philosophies about love are different. Accompanying their youthful passions are the feelings of self-doubt. 청춘이란, 바로 그런 것이 아닌가 싶다. 사랑하고 미워하고를 반복하며 관계를 만들어 가는 것. 그 관계가 어떠한 결과를 초래할 지라도. 청춘은 우리를 또 사랑하게 만든다. What is youth? I sometimes think of it this way. We love, we hate and we repeat. That seems to be how relationships are built. Youth leads us to love again. One German poet, Freiligrath, writes. Love as long as you can! Ji Eun (Seo Hyun Jin) is a talented pianist. I love her singing voice too! She represents the youth that is hidden and chose to be left alone. I think she does not know how to really express herself so she uses her composition to convey it. I actually like the rhythm of Magic. It suits her feelings of unrequited love. Her composition is a way to represent her heart. It has two versions here. And the first part belongs to Jung Woo and I think that means her heart is with him. Jung Woo is her first love. Though its kind of unclear, really, but that’s what I thought. It’s interesting to note that she plays the piano with her shoes off. Like she’s bearing herself through her music. This nakedness reveals her true self somehow. Ji Eun is an ardent musician and it is shown best when she’s alone inside the music room. Jung Woo (Kim Jung Wook) is a gifted cellist. I say gifted because his talent is innate, no efforts needed much because he has it. Just give him a cello and it will come to life. Jung Woo is passionate and he’s very much in tuned with his cello but a very troubled person nonetheless. I think his sickness kind of represents that problem. Like his cigarette, his life slowly diminish as he continues to puff and breath it. He represents the youth that enjoys the now and not care about tomorrow. Reckless but driven by his love for music. I like how he interprets the composition of Ji Eun as something like an “unrequited love” or “one-sided love”. He also has the same feelings which I think refers to something he can’t have. He has his music already. But as he always say, there are things we CAN’T have. 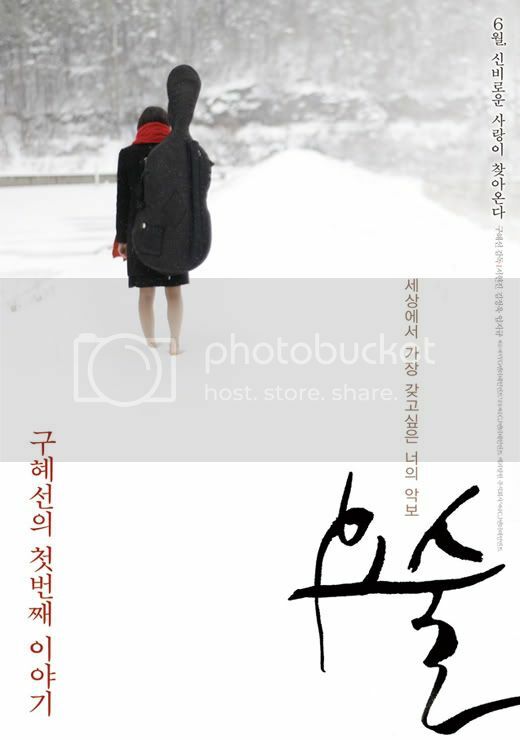 Myeong Jin (Im Ji Kyu) is an aspiring cellist who studies in a music school. He’s actually the apprentice of Jung Woo, well sort of. Myeong Jin’s character has hidden feelings for Ji Eun. They have been friends for quite sometime but hasn’t expressed it until he performed my favorite part of the movie, the serenade. I felt like Ji Eun right about that very moment. Myeong Jin is a typical “torpe” or a coward man but focused. I think he represents the quiet-subtle form of youth that are on the side line but can stand out given a chance. He strives and persevere in his craft. He also uses his music to express what he feels. Though he still lacks in so many ways, I think he proves that by practicing, we can all reach our goal. This film is driven by music and I love ALL the instrumental part. Even the parts where the song Dream of Love was sang by the choir! The cinematography is just beautiful. Hye Sun really has an artistic vision displayed through the angling of the cameras seen in the film. The shots are simply wonderful. I like the transition actually, particularly for Myeong Jin. I like the montage where at first he was just getting few coins for his music and eventually he’s getting more out of it. He eventually improves and was represented visually. Nice touch. I appreciate that and prefers more than words. Or since this is low budgeted and has limits, I appreciate that Hye Sun showed changes through this. I love how Hye Sun envisioned Ji Eun. Her character is a bit cold but Hye Sun wrapped a red scarf to give her warmth and served as a balance. It is in small things that Hye Sun puts her message. Moreover Ji Eun has this vibe of detachment. I think the way she puts a chalk by the door is her way of not letting someone in while she immerse herself through music. Though, she just allows a few gap enough for people to have a peek. It seems that this is why Myeong Jin finds it hard to really get close. As I’ve mentioned, there are less dialogue here than usual. But it is spoken with depth or hidden meaning most of the time. The film started that way and worked all throughout. I believe this is one part of Hye Sun’s persona, she enjoys hidden meanings and I like that she’s not superficial. Lastly, I LOVE the SERENADE. Such a wonderful mix of sounds! I think that’s the BEST part of the movie. I love Myeong jin’s confidence while he plays the cello!! If a guy plays a piano infront of me, that deserves a YES! Music is one of my weakness and the scene here, just heart stopping! The vibe of all the students who participated, you just know it screams LOVE. Aww! help from friends!! This is effort people! Brilliant display!! You have to watch it yourself to know what I mean. I tried to put screen caps BUT the essence can be felt best when you hear the combination of natural sounds and that of the instruments. Hye Sun’s IMAGINATION. Instead of the usual flash back or dream sequence we see in most dramas or movies, Hye Sun put a twist on that by representing it with the door. At first, I actually didn’t understand the purpose of the door. But I guess since we use door to enter another place, so she used it as such. Visuals are really Hye Sun’s way of telling a story which make this movies harder to grasp at times. I literally watched this more than 10 times! And these are just my own thoughts. Which hopefully are close to what she intends to portray. Overall, this movie is raw and visually wonderful. The story evolves around the music having its focal point. Since the music is the characters way of revealing their emotions. When they hold and play their instruments, the real emotions are poured out. I think the actors played it fairly. The sadness that they felt during the latter part are still musically patterned. The ending is quite questionable. And up until now I’m thinking about its purpose. Though its a really nice way of ending the movie having the three leads look at the beach, which I think represents a peaceful life, TOGETHER. I think that what makes this movie linger to those who have seen it. You question the movie and you are left with thoughts of what could have been. I am in awe of Hye Sun’s intelligence and her talent as an artist. I think she’s unique and a natural genius! She may look like she’s doing so many things and is not focused. But I believe, just like her movie Magic, that has a variety of meaning, it still boils down into one thing. Expression. Through that, Hye Sun is allowing herself to be known by others through her art that is seen in her movies, drawings, writings and acting. I’m a fan of Ku Hye Sun. She is not only one of the stars shining out there. But I believe she has a lot to offer not just to merely shine above the rest. She’s multi-faceted and she allows herself to explore her limits. I’m so looking forward on her next film. I hope she does not lose her touch by making it too commercial. Since Hye Sun is best when she use her OWN style. Though a bit deep, its what makes her uniquely HER. Hi leila8mae, I am so glad you have this blog, congratulations! I really loved Magic, I had to see it several times because I felt like I was uncovering different things each time I saw it (I was pleasantly surprised that GHS used Habanera from Carmen as one of the BMGs, which I failed to recognize the first time I watched it). I understood and appreciated it better after seeing it for the second time, the rest of the viewing repeats were just for pure entertainment. I agree with most of your comments, I need not get into the details as you have already mentioned these. I know not all people who have watched the movie appreciated the non-linear presentation of the story but I think it would help if the viewer asks himself questions that would lead to theories that may aid in understanding the story, although viewers who would see a movie with being entertained as the primary objective may not want this part. It seems that GHS is the type who would like her viewers to really think and dig deeper into the material that she is presenting. It is like throwing puzzle pieces on a table leaving the audience to piece them altogether leading to a conclusion/end of the story which may vary from one viewer to another. Overall, GHS did an excellent masterpiece in my opinion. The actors were perfectly chosen for their respective roles as well. The musical scoring was the main highlight as expected. With this experience, the more that I get excited looking forward to seeing her next projects. BTW, I have also seen her unsubbed short film starring Nam Sang Mi and it had the same GHS imprint, creative with some thought provoking slants. Now, if I could just get hold of a subbed version of the Cheerful Caretaker, then I could say I have caught up watching her masterpieces to date. Add to that an English subbed Tango??? Wishful thinking…..
sis Alpenrose!! you made me smile BIG time ;D thanks for the long comment!! haha.. it took awhile for me to finally conclude this review and I still have doubts at how I actually interpreted most scenes!.. hopefully its close enough to its true intent.. I agree with you that GHS lets her audience THINK.. I was entertained by the music but the story is not for the general movie goer, IMO. GHS is very creative and she explores her medium further than what others would do for a first film.. and kudos to her, this is her FIRST only! buts she has shown great visuals already.. I just love every shots here.. if this is not low budgeted, I think the story could have been presented better.. limitations affected it I guess.. but I personally think Hye Sun is satisfied with this because her view point was shown, her way..
like puzzle pieces.. you said it better!! this is a treasure that needs to be uncovered.. and as a viewer you need to see beyond what is presented and eventually you’ll learn to appreciate it as a whole..